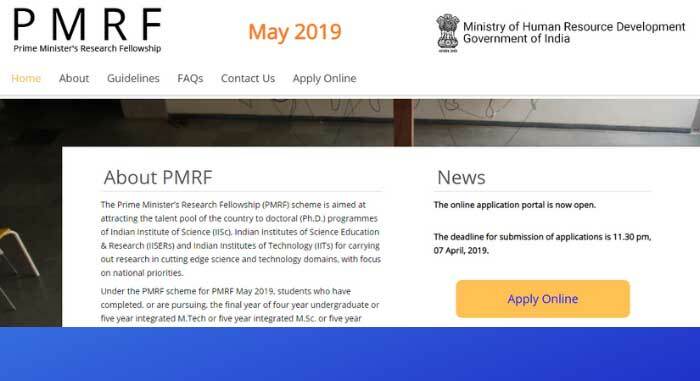 PMRF or Prime Minister’s Research Fellowship scheme aims to attract the talent pool of the country to doctoral programmes of Indian Institute of Science (IISc), Indian Institutes of Science Education & Research (IISERs) and Indian Institutes of Technology (IITs) for carrying out research in cutting edge science and technology domains, with focus on national priorities. If you are interested to pursue PhD studies in the field of science and technology, PMRF is a golden opportunity for you to get started at reputed institutions in India. The fellowship is offered by the Ministry of Human Resource Development (MHRD), Government of India. Who is eligible for PMRF? How can a student apply for PMRF? What is the selection process? What kind of financial assistance does a student receive under this scheme? Find an answer to all these questions in details in this article. It highlights every important and relevant information about the PMRF such as its eligibility, application process, selection process, abstract submission and much more. 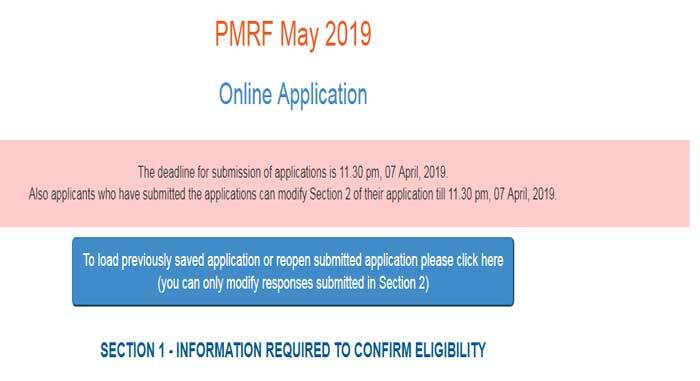 The PMRF application window opens in the month of April-May every year. For the year 2019, the deadline for submission of applications is 11.30 pm on 07 April 2019. The fellowships will be disbursed by MHRD in the month of May 2019. The key dates for the fellowship are given in the table below. The applicants should adhere to the following eligibility conditions to apply for the PMRF. They must be pursuing or completed the final year of 4-(or 5) year undergraduate/5-year integrated M.Tech/5-year integrated M.Sc./2-year M.Sc./5-year undergraduate-postgraduate dual degree programs in Science and Technology streams from IISc/IITs/NITs/IISERs/IIEST. They must have completed or pursuing the final year of 4-(or 5) year undergraduate/5-year integrated M.Tech/5-year integrated M.Sc./2-year M.Sc./5-year undergraduate-postgraduate dual degree programs in Science and Technology streams from any other Institute/University in India (other than those mentioned above). These candidates should have secured a CGPA/CPI of at least 8.0 (on a 10-point scale) or equivalent. The students must have qualified GATE and be pursuing or have completed M.Tech./MS by Research at IISc/IITs/IISERs having a minimum CGPA or CPI of 8.0 (on a 10-point scale) at the end of the first semester with a minimum of four courses. They must have completed the required academic qualifications mentioned above in the preceding three years from when the application is submitted. The applicants who fulfil the eligibility criteria, and are finally selected through the specified selection process, will be offered admission to the PhD programme in one of the IISc/IISERs/IITs. Besides this, the PMRF also offers suitable financial assistance to students that include a fellowship of INR 70,000 per month for the first two years, INR 75,000 per month for the 3rd year, and INR 80,000 per month in the 4th and 5th year. There will be a rigorous examination of the performance of Prime Minister’s Research Fellowship holders and continuation of the next year fellowship shall be contingent upon successful assessment. The students who are selected for the PMRF will receive a fellowship award in the following manner. For each broad discipline, one IIT or IISc will coordinate the admission process and will be referred to as the Nodal Institute for that broad discipline. With the advent of technology, everything is now available online and so is the application process for PMRF. All eligible candidates can apply for the Prime Minister’s Research Fellowship online through its official website. 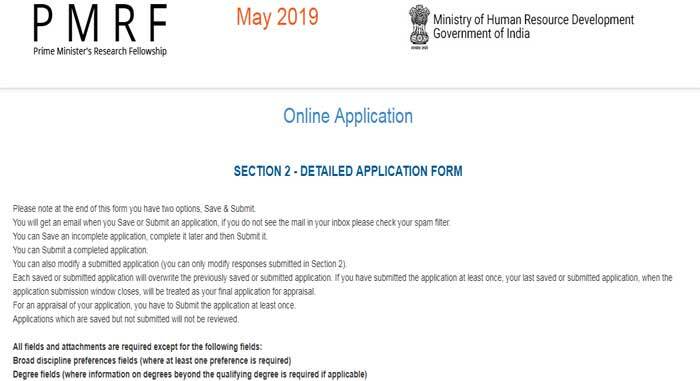 Every year, the MHRD opens its dedicated online portal to invite applications from eligible candidates in the month of April and May. How can you apply for the fellowship? What are the steps to be followed for the successful application? Get a step-by-step detail of PMRF application process hereunder. Step 1: Visit the official web page and read the instructions carefully before applying. Step 2: Click on “Please Click Here to Apply Online” and proceed further. Step 3: Select the “Qualification” option and fill the section 1 about eligibility. Step 4: On the next page, in section 2, fill personal, education details and upload photograph and required documents. Step 5: Pay the application fee of INR 1500 online through the link provided in the application form. Step 6: After successful payment of the application fee, upload the application fee receipt and submit the form. CV limited to two A4 pages and submitted only in pdf format. The CV should emphasize only academic achievements and skills, e.g. ranks, merit certificates, internships, publications, research related software skills, etc. The selection of fellows is done by the Selection Committee that is constituted by the nodal institute. For each subject area, the Selection Committee conducts the interviews and select candidates. However, the allocation of the Institute for the doctoral study would be done keeping in view the choices of the selected candidates and the availability of academic and other infrastructure. The abstract should be originally written in the applicant’s own words and should limit to 1000 words. The abstract should have the applicant’s name at the beginning. The project abstract should clearly articulate the area of the study and should highlight the interest and insights for the subject chosen. The project abstract should formulate a problem for study. This will be used for assessing the applicant’s analytical and research skills. The referees and the applicant have closely interacted with each other during the applicant’s undergraduate or postgraduate program. The referees should be able to comment on the applicant’s educational capabilities, research and analytical skills. An applicant can select up to five broad disciplines for each of which the applicant will be assessed. Q. Is there an application fee, and if yes how can a student pay the application fee? A. Yes, there is an application fee of INR 1500. The fee can be paid online via the application form. For more details, check the “application process” section. Q. If a student has a specific idea for his/her potential research topic. Will the selection committee consider this while allocating him/her an institute/discipline if he/she is selected? A. The selection committee will take a holistic view of the project details, subject knowledge, research & analytical skills, in making the recommendation on the suitability of the candidate for the PhD program under the PMRF scheme. The selection and allocation processes are decoupled. If the candidate is selected for PMRF for one or more disciplines, the allocation for discipline will be based on an algorithm that will take care of merit position and the preference order of the combinations of the institute and discipline the candidate has provided. Q. If a student is a PhD scholar in a host institute and graduated from an AICTE recognized Institute and joined IIT under the Direct PhD programme. Whether existing scholars like him/her who meet all the criteria, but have joined last year will be eligible to upgrade to PMRF? A. The applicant has to apply a fresh application. If they are allotted any institute other than the parent institute they will have to join as a totally fresh registration at the new institute.